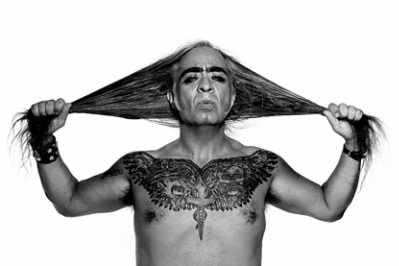 Guillermo Gómez-Peña﻿ is a performance artist, writer, activist and radical pedagogue and the director of the performance troupe La Pocha Nostra. He was born in Mexico City and came to the US in 1978. His performance work and 8 books have contributed to the debates on cultural diversity, border culture and US-Mexico relations. His art work has been presented at over seven hundred venues across the US, Canada, Latin America, Europe, Russia, south Africa and Australia. A MacArthur Fellow and American Book Award winner, he is a regular contributor to National Public Radio, a writer fornewspapers and magazines in the US, Mexico, and Europe and a contributing editor to The Drama Review (NYU-MIT). La Pocha Nostra is an ever growing cross-disciplinary arts organization and non-profit based in San Francisco, California with branches in Central and South America, Europe, Asia and the South Pacific. La Pocha Nostra was founded in 1993 by Guillermo-Gomez-Pena, Roberto Sifuentes and Nola Mariano in Los Angeles. The goal was to formalize conceptually Gomez-Pena's collaborations with other performance artists. Core members of La Pocha include Guillermo Gomez-Pena, Roberto Sifuentes, Michelle Ceballos Michot, Saul Garcia Lopez, Dani d'Emilia, Erica Mott, Violeta Lune and over 30 associates worldwide. Our projects range from performance solos and duets to large scale multi-sensory performance installations involving photo, video, sound and projection. If there is a common denominator, it is our desire to cross and erase dangerous borders including those between art and politics, art practice and theory, artist and spectator - ultimately to dissolve borders and myths of purity whether they be specific to culture, ethnicity, gender or language.